Last week we covered the heart print. I wanted to expand on that today and talk about another great graphic print: the bow. we all know I'm a sucker for a big 'ol bow but what about the actual print of a bow? A little less girly, a little more laid back. 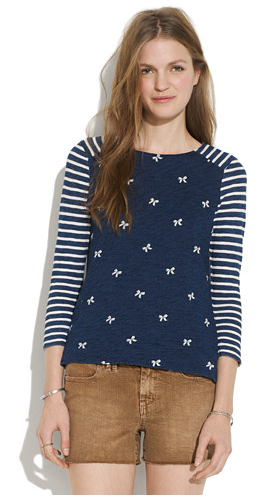 I think of this as a girly nautical look. 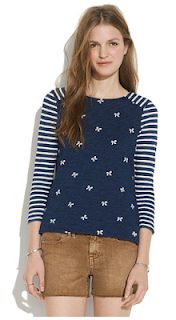 Knots and stripes. 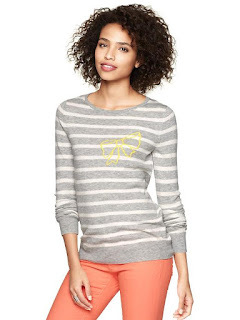 For a more understated bow, try this great top from Gap. The eversoft collection is just what the name promises. Feeling brave? Try these amazing cords. This top will hide any problem area you can think of. The peplum and the wrap is just the perfect way to hide the tummy and accentuate the smallest part of your waist. So instead of opting for an actual bow, try out a graphic bow today.